I had heidi sql version 9 install. I presume you were running the 32-bit version of HeidiSQL 9 at C:\Program Files (x86)\HeidiSQL and you installed HeidiSQL 9 at C:\Program Files\HeidiSQL so now you have both. Is that right? (As about your question, 64-bit Windows can run both 32 and 64 programs, but 32-bit Windows cannot run 64-bit programs at all so that's the only way to create a "universal" one-size-fits-all installer). I had the same issue. As well as an "Unknown Publisher" warning from Windows Defender. Previously I used the installer for HeidiSQL 9, and it installed the 64 bit version to C:\Program Files\HeidiSQL\heidisql.exe. 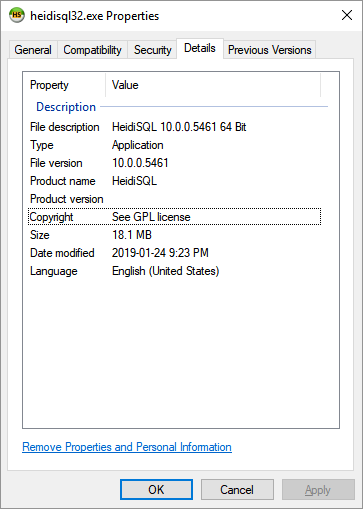 I also tried the HeidiSQL 10.0.0.5461 installer with the same results. The v10.1 release fixes this issue. Installing it will also delete the wrongly named "heidisql32.exe", and copies a fresh heidisql.exe.